I’m currently studying over at my dad’s house and I bumped on a package of rice paper just the other day, while I was on a hunt for food in the fridge and the kitchen cabinets. well, that should make a great and nutritious dinner. I’m so glad I asked him to do some groceries for me cause now I at least have some veggies, fruit and some rice. Salad with cherries tomatoes,spinach and carrots. One version is made with spinach, strawberries and half a peach. The other version is made with a wild rice and quinoa mix, smokes almonds, pine nuts and dried figs. 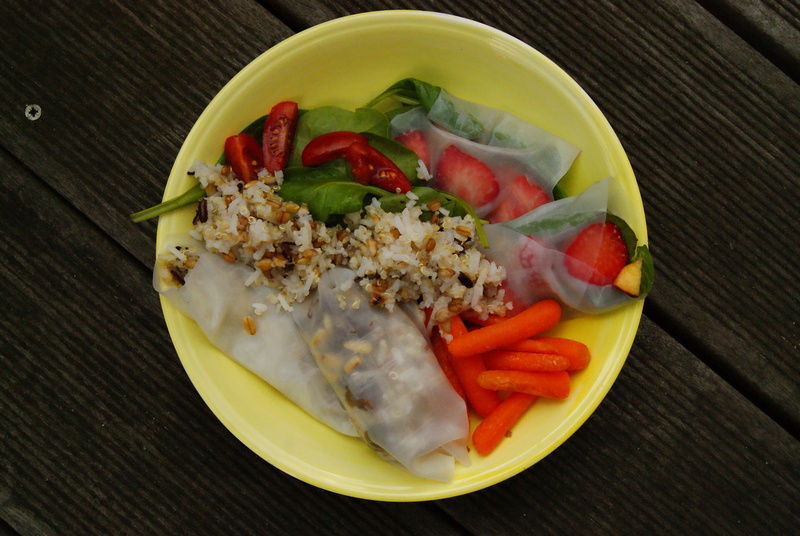 And in case you never worked with rice paper before, have no fear: it’s super easy and quick. All you need is bowl, fill it with cold water, place the rice paper in and let it soak for about a minute,take them out, place them on a towel and stuff them. This entry was posted in food and tagged dried figs, peach, pine nuts, quinoa, rice paper, smoked almonds, spinach, spring roll, strawberry, wild rice. Bookmark the permalink.